The approach of Halloween has always frightened me, the thought of the dead rising and walking the earth for a night. This year, Neil Gaiman put up a great short video asking everyone to start a new tradition – give a scary book for All Hallows Eve, #AllHallowsRead if you are on twitter. I loved the idea, and I think I will give a scary book. Telling scary shory stories, perhaps gleaned from dreams or haunting visions, is cathartic. Like baking, I like the finished product of storytelling – books – more than the process of writing. Here is one of mine, originally out in Death and the Dream, my first collection of short stories. 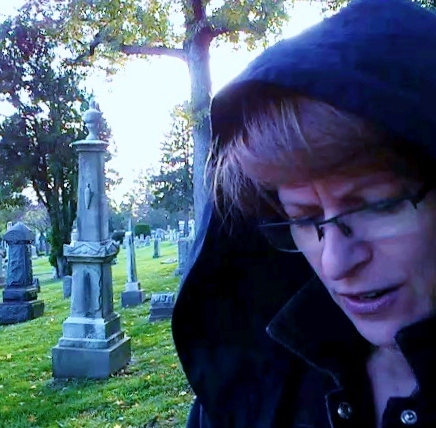 I read Rabbit Nightmare in Cypress Hills Cemetery in Brooklyn, filmed by Lillian Rodriguez. This Halloween, will you give a scary book? Tell a scary story?